Just in case you’ve been living under a rock, I’ll fill you in: Fall Out Boy is back with the intention of saving rock and roll. I have my opinions on this album (“The Phoenix” is probably my favorite track, Patrick Stump’s voice is still what all my golden dreams are made of, BUT this is my least favorite of all the FOB albums), but in general, I’m really glad they’re back. I don’t think most of us really believed that “on hiatus” business, so it’s a pleasant surprise to see one of the bands I grew up with making music again. I have another reason to celebrate the return of Fall Out Boy: one of the major characters in my current novel project is obsessed with them. He quotes them, wears their t-shirts, covers his walls in posters of them. He takes their music very seriously and is offended when others don’t. It’s funny. It was funnier when they were out of the picture and being slowly forgotten by the industry, but now it’s interesting, and I don’t yet know what to do with their sudden reappearance. Even though they're not one of my top favorite bands, I’ve listened to hours upon hours of Fall Out Boy in the past 7 months or so. Because their music is so intimately connected with the work (and because I’m so familiar with the songs at this point), I’ve found I can listen to them while I’m writing, even though I usually can’t listen to anything with words because it distracts and confuses me. I mostly listen to Infinity on High, but the rest too. I also listen to them while walking to class, in the car, at the gym, wherever I can, and it never fails to get me in the writing mood. Oddly enough, many of the characters in this WIP were inspired by a different band altogether-- My Chemical Romance and their latest concept album, Danger Days: The True Lives of the Fabulous Killjoys. (I won’t talk about the end of MCR. Suffice it to say I haven’t been able to listen to them since because I hate crying. In the meantime, here’s a great post on the topic by fellow literary citizen Sarah Hollowell). The Killjoy characters and the associated music videos fascinated me, and they had a light but definite impact on my work. Music is art and writing is art, so it shouldn’t surprise us when they end up woven together. Personally, I embrace music as fuel for my writing. It inspires me, it opens up new avenues for exploring characters, and it keeps me focused even when I’m away from the keyboard. I have this fun little habit that I think is actually helpful to the writing process: character theme songs. Do any of you do this? I often assign my major characters a theme song. Sometimes it takes me awhile to find the right one, but when I do, it usually helps me understand the character even more deeply. At minimum, hearing the song will get me pumped to write! 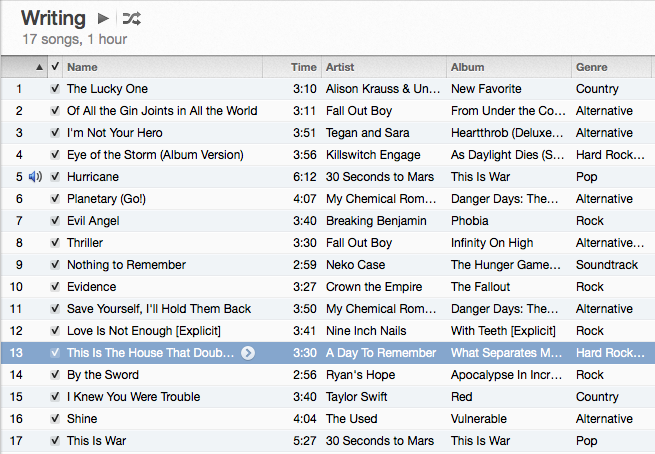 There's a screenshot of my writing playlist below. It has mostly character theme songs from my two WIPs, but also just some that are generally inspiring. Got a writing playlist of your own? Do you assign your characters theme songs or speculate on their music tastes? I have a Spotify Playlist for one of my characters. She listens to a lot of Billie Holliday and Mazzy Star.